Rice Pudding. How do I love thee? Let me count the ways. You are creamy and milky. You are easy to make. You fill me up. You are the perfect anytime dish when the weather has turned so cold I cannot even pretend I want to go outside. You fill the kitchen with the smell of happiness. And I never had any bad boarding school experiences with you. I love rice pudding. I particularly love it warm, eaten straight from the pot sitting at the kitchen table with a good book. I suspect most of you do not feel this way about it. Its one of those hit or miss desserts (breakfasts sometimes) that people either have a horrendously atrocious memory of or a fond one. I’m obviously in the latter category (otherwise why would I be writing this post?). You can flavour rice pudding with almost anything that takes your fancy. Cinnamon? Cardamon? Nutmeg? Vanilla? And you can eat with lovely cooked fruits like apples, pears or peaches. You can even put chocolate in it. See, its fabulous. Today I’ve made a plain vanilla one. I had a restorative nap this afternoon and woke up with a craving for rice pudding like nothing else. But the reason I’ve been craving rice pudding is all to do with the new Penguin series, Great Food. I don’t usually go in for token, random series books but these are an exception. Firstly, they look spectacular. They are beautiful and some day when I’m rich I will have the series in its entirety. You can view them here. Secondly, they are actually read-able, contain recipes and are written by some of the gems of food writing like Brillat-Savarin, MFK Fisher, Elizabeth David and Alice B Toklas. There are also books by Claudia Roden (my current read) and Alice Waters. Thirdly, they’ve included in the series housekeeping/cookbook guides for the 18th and 19th centuries which are a total riot and which started my whole rice pudding craving debacle. Whilst leafing through Hannah Glasse, 18th century cookbook author extraordinaire, whose book is Everlasting Syllabub and the Art of Carving*, I stumbled across her instructions for rice pudding in the chapter Preserving and Storing (a chapter she writes is useful for captains of ships). She says you should select rice you think appropriate, and boil it in a cloth for an hour. After the hour is up, untie it, sweeten it, add in some nutmeg and a knob of butter. Then retie it and boil the rice for another hour. This you eat with a sauce made from butter, sugar and a little white wine. Totally fabulous. I’ve never boiled rice for two hours and am unlikely to try anytime soon so I can only imagine what this must have tasted like. Other gems in this book of receipts are ‘a certain cure for the bite of a mad dog’ and ‘to ragoo hogs feet and ears’. The spellings alone are cause for amusement. Actually making rice pudding is cause for some debate. I make mine like risotto. You fry the rice in a little butter before adding in the sugar and spice of choice followed by the warm milk. You let this bubble away nicely for about 40 minutes, stirring occasionally until the rice absorbs the milk and becomes soft and squidgy and the entire mixture is thick. 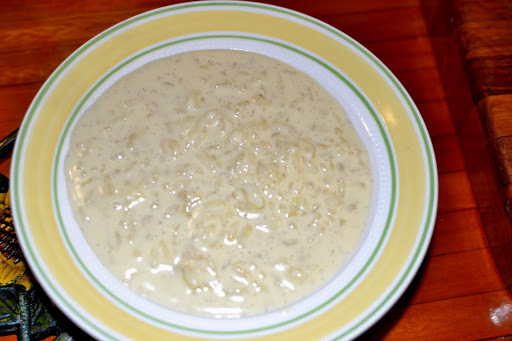 Others prefer to make an anglaise (custard), pouring this over the rice and then baking it in the oven until the top is golden brown. Still others start with the risotto method but finish it in the oven for the ‘crust’. I’m not a fan of ‘crusted’ rice pudding so thanks, I’ll stick to the first method. When I checked David Lebovitz’s book, Recipe for Dessert, he makes it this way too. 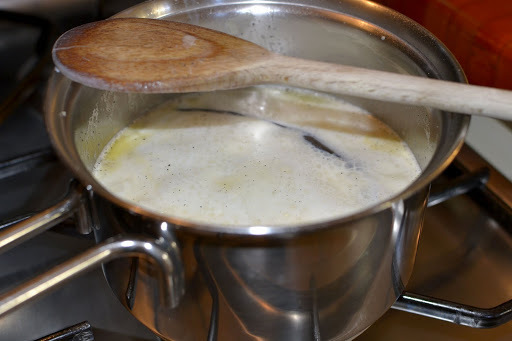 Melt the butter in a pan and when it is foaming, add in the rice. Heat the milk in a separate pan or the microwave until warm. Stir the rice around a little (one of the chef’s I trained with had this thing about only stirring clockwise the entire time you made risotto so that the rice didn’t get too bruised. I have no idea but only stir clockwise now) then add it the sugar. Scrape the vanilla seeds out of the pod and add seeds and pod to the pan. Finally pour in the milk. Give it a good stir and leave it to simmer away merrily, stirring on occasion. If there is still a lot of liquid but the rice is cooked, switch off the heat and allow it to stand for a few moments. Rice pudding thickens as it cools. *. I mean the title alone is worth the book price.